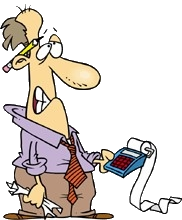 Have some fun and learn a little accounting and bookkeeping too. These bookkeeping and accounting quizzes, exams, cross word puzzles and games help to determine your knowledge about bookkeeping and accounting topics. Test your knowledge by answering these accounting questions! Try your hand with my Walk The Plank, Basketball, Teacher Invaders, En Guarde, and Fling The Teacher bookkeeping games. Answer bookkeeping and accounting questions correctly and make me walk the plank, shoot hoops, shoot invaders, sword fight, or fling me away. Over 150 Accounting and Bookkeeping Quizzes, Skill Tests, Puzzles, and Games, with over 2,500 questions and answers are provided for you to see what you know about basic accounting principles and concepts. When you select a quiz, the quiz is opened in a new browser window. To return to the Main Quiz Menu you can select the browser Back Button or click on the Return To Menu Link. Reinforce your accounting and bookkeeping knowledge with these free bookkeeping and accounting quizzes, games, and exams also included in my bookkeeping tutorials. These accounting tests and games cover introductory bookkeeping and accounting concepts and are provided for those wanting exams to test their accounting and bookkeeping knowlege and skills while having a little fun too. These additional accounting tests and games also cover introductory bookkeeping and accounting concepts and are provided for those wanting additional exams to test their accounting and bookkeeping knowlege and skills while having a little fun too. Sorry, life can't always be fun and games. My sister site, Bookkeeping Testing, has the "ole" fashion exams that we are all accustomed to. My skills testing site provides accounting and bookkeeping skills testing and exams in order to help employers evaluate a prospective employee's knowledge and qualifications. In addition, practice tests are provided to aid anyone seeking a bookkeeping postion or just wanting to test their accounting knowledge. Learn to do by doing ! This sister site of mine, Bookkeeping Practice, uses a fictional business, Baldy's Barber Shop, to reinforce the skills you've hopefully acquired in your studies and illustrates the benefits of using bookkeeping and accounting software.